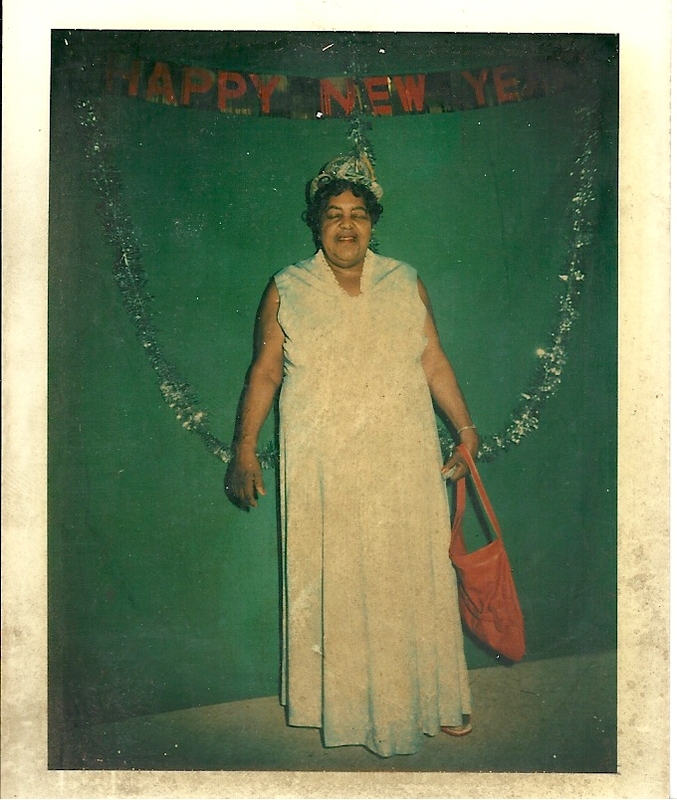 Pictured to the left is my maternal great-grandmother Margaret Payton celebrating New Year’s Eve in Baltimore in 1977. This Polaroid photo was taken in what I assume to be a photo station at the party as suggested by the green fabric background and lighting. At the time this photo was taken Margaret – also known as Queen – was a 63 year old grandmother of four and great-grandmother to one. I absolutely love this photo of her because it offers some subtle (or maybe not so subtle) suggestions of the vibrant personality of an ancestor I never met! There are a few things about this photo that I really love. 1. The Tilted Party Hat. The silver hat seems befitting for a woman named Queen and one who knows how to party! 2. Large Fire-engine Red Purse. I imagine she chose to carry a large red purse for practical reasons: red matches Christmas/New Year’s holiday decor and a large purse is necessary if a person needs to carry a lot of things. 3. Not-So-Winter White Dress. The dress fits nicely, providing modesty and sophistication without revealing her age. Still, her choice to wear a floor length white dress in the middle of winter suggests her unconventional style and comfort with her full-figure. 4. Facial Expression. Her eyes are completely closed. There could be a number of reasons why someone would take a photo with their eyes closed (i.e. blinking, unprepared, etc.) but I can’t help but think that maybe she just had a great time…if you know what I mean. I’m looking forward to getting to know more about Margaret’s life in 2012!